Hive Jump is another one of the games that EBongo and I got to try out while on the expo floor at PAX South. I'd scouted these guys ahead of time, because Hive Jump ticks a bunch of boxes for me. I love co-op games, I love roguelikes, I love sci-fi, big weapons, big enemies, and exploration and RPG elements. While at PAX South, we watched a round and then played one with a couple of other con-goers. The co-op is innovative and well implemented. One of the four players carries "the backpack" - a device that allows the other 3 players to respawn if they are killed. If the player carrying the backpack is killed, the backpack is dropped and is vulnerable until someone else touches it and begins carrying it. It's similar to the way "the bucket" worked in Final Fantasy: Crystal Chronicles, but without the annoyance associated with being the bucket-bearer. In both games, the camera tends to follow whoever is carrying the device. In FF:CC, though, the bucket kept you from fighting and slowed your movement speed. The backpack in Hive Jump doesn't impair the player carrying it, though. What the backpack means in practice is that if there's a particularly strong player, they can help carry the team by keeping the it safe. The other players are a bit more free to experiment, take risks, and make mistakes. The 16-bit era graphics with a touch of modern graphics wizardry is just icing on the cake. It's beautiful icing, to boot. The enemy sprites are large and detailed, and the bigger bosses rival the level of detail found in 16-bit era classics like Super Metroid. Where the Metroid games have focused more on exploring a static environment for upgrades and bosses, Hive Jump here diverges. The levels are procedurally generated, like Spelunky. Enemies spawn that you can fight to get this yellow "goo" that can be exchanged between levels for better gear, like rocket launchers or grenade power-ups. 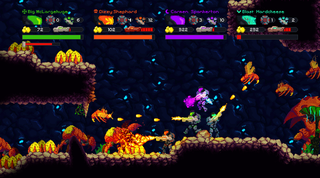 Bottom Line: Despite being an early alpha, Hive Jump is already a mind-blowingly stellar co-op experience. It blends elements from several genres and adds innovative new ideas to create a game that I'm already excited to play.